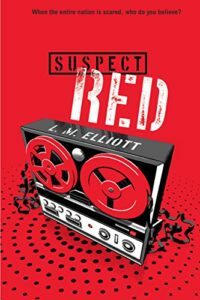 The early 1950s come alive in Suspect Red with each chapter starting with “current” events, news articles, and information about 1950’s pop culture. The book contains pictures of people, places and events from 1953-1954 as well as comics and maps. A good argument for audio-listeners to have both the book and the audio versions! Author L. M. Elliott explores the themes of patriotism and loyalty within the context of the Cold War. Is it possible to be a true and loyal patriot and at the same time question the actions of our government? In the course of this story you’ll also get a chance to meet people who will later become prominent figures in US history such as Jacqueline Kennedy, Mrs. (Lady Bird) Johnson, and Richard Nixon. The Afterword at the end describes in more detail many of the people and events that played an important role during the Cold War. Richard Bradley is a book nerd who doesn’t have many friends. All of his adventures are contained in books such as Robin Hood and The Catcher in the Rye. He yearns for the day when he’ll have his own adventures catching spies, using codes and performing acts of derring-do just like his father who is an FBI agent. Richard is excited when a new family moves into the neighborhood. Vlad, much to his surprise, also loves books and reading. Vlad’s mother is from Czechoslovakia and his father is an American who works for the State Department. Even though Vlad was born in Czechoslovakia and was raised in London and New York before moving to Washington, DC, he seems to know more about American culture and music than Richard does. Richard and Vlad soon become fast friends. Meanwhile, things are changing for Richard and the rest of the country. Since Richard’s father works for FBI director J. Edgar Hoover and Senator McCarthy, Richard’s mother is very careful not to have any banned books, art or music in the house. Richard’s beloved book Robin Hood is one of the banned books that his mother confiscates. While Richard understands the need to keep the United States safe from the communists, he doesn’t know how The Merry Adventures of Robin Hood could be a threat to the country. Wasn’t Robin Hood a hero? And things are also getting very tense with his father, who is suffering from mood swings and anxiety. He learns that his father is still suffering from the time he was a POW during the war and that he has also had some major setbacks as an FBI agent. His father needs to crack an important case for the FBI to be redeemed both in the eyes of the FBI and himself. Richard decides to be the one who helps his father crack a case and become a hero. Richard now spends most of his free time at Vlad’s house and on several occasions has witnessed Vlad’s mother acting suspiciously. Could she be a communist sympathizer or even a communist spy? Should he tell his father or stay loyal to his friend? Is there even anything to tell? Richard quickly realizes that while the right thing to do is always clear in his books, in real life things are rarely so cut and dry.